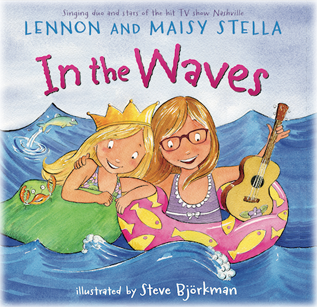 HarperCollins Publishers announced the release of IN THE WAVES, the first picture book by Lennon & Maisy that is based on their original song of the same name. The book was illustrated by Steve Bjorkman and released on April 28, 2015. You can get the book HERE and download the song HERE. Told through song lyrics, the book follows two sisters as they dream about an exciting day at the beach. With boogie boards in tow and homemade lemonade in hand, they are ready to splash the day away. But when their trip to the beach turns out to be something else altogether, readers will see that all it takes to have a great time is a little imagination. The perfect read-aloud or sing-a-long, this book is sure to make every day fun in the sun. "There are no words to describe the excitement we have for the release of "In the Waves," says Lennon and Maisy. "What started as a fun little ditty we would sing in the bath when we were little, has now turned into something we are so proud to share! Thank you, thank you, thank you!" "It's such a thrill to have the opportunity to publish the first book by the amazingly talented Lennon and Maisy Stella," says David Linker from HarperCollins. "The combination of an incredibly catchy original song and their fun-filled lyrics make this book perfect for any family's library." With a sweet surprise ending, this story will delight readers young and old, and with photos of the girls from years past, this picture book keepsake is the perfect present for any Lennon and Maisy fan.